This jalapeño cheddar cornbread takes cornbread to the next level. It’s THE BEST recipe out there – soft, tender, and packed with flavor with a mild level of spice. This is not a recipe to be skipped. 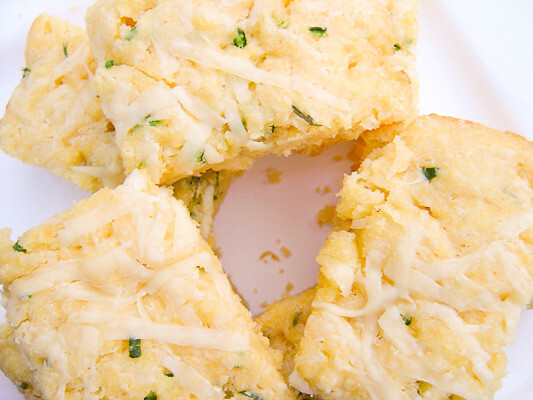 You will not regret making this jalapeño cheddar cornbread. It was so incredibly easy to put together (5-7 minutes, tops) and the results are well worth the 20 minute pre-cook wait. I halved the recipe, used a 9″x11″ Pyrex dish (which still makes a lot of cornbread) and cooked it for 22 minutes. Perfect. Just perfect. It’s soft, tender, cheesy, delicious, and not at all spicy (I removed the seeds and pulp from the jalapeño). This one’s a keeper! Preheat the oven to 350° F. Grease a 9×3-inch baking pan. Combine the flour, cornmeal, sugar, baking powder, and salt in a large bowl. In a separate bowl, combine the milk, eggs, and butter. With a wooden spoon, stir the wet ingredients into the dry until most of the lumps are dissolved. Don’t overmix! Mix in 2 cups of the grated cheddar, the scallions and jalapeños, and allow the mixture to sit at room temperature for 20 minutes. Pour the batter into the prepared pan, smooth the top, and sprinkle with the remaining grated cheddar and extra chopped scallions. It looks great, and I like the idea of the chives. I liked it, but just couldn’t classify it as cornbread. Wow, that looks fantastic! I am definitely going to have to give this recipe a try. I love this recipe and pretty much anything the Barefoot Contessa makes. I have made this before and have added my own little touch by tossing in there some goat cheese. This adds such great flavor. PS your pictures are wonderful and jump right off the screen!! Yummy-looking cornbread…and thanks for the flexibility on posting. I also ran late with my cornbread this month and will post it later. Looks great! We really loved this recipe as well. I prefer my cornbread to be more cake-like, so I thought this was just perfect! Yours looks terrific! I liked the cakey texture and taste it but then Iam not a huge cornbread fan either so maybe that’s why.